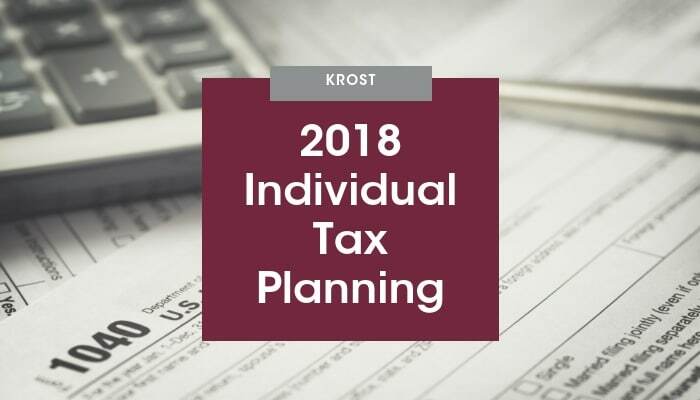 Year-end planning for 2018 takes place against the backdrop of the new 2017 Tax Cuts and Jobs Act that make major changes in the tax rules for individuals. There are new, lower income tax rates, a substantially increased standard deduction, severely limited itemized deductions and elimination of personal exemptions, an increased child tax credit, and a watered-down alternative minimum tax (AMT), among many other changes. For tax year 2018, the old 10%, 15%, 25%, 28%, 33%, 35%, and 39.6% tax brackets have been changed to 10%, 12%, 22%, 24%, 32%, 35%, and 37%. The standard deduction increased to $12,000 for singles and married persons filing separate returns and $24,000 for married couples filing jointly, up from $6,350 and $12,700, respectively. The standard deduction for the head of household filing status rose to $18,000, up from $9,350 in tax year 2017. Although the standard deduction increasing, various itemized deductions have been cut back or abolished. Miscellaneous itemized deductions and unreimbursed employee expenses are no longer deductible, personal casualty and theft losses are deductible only if they’re attributable to a federally declared disaster and only to the extent the $100 per casualty and 10% of AGI limits are met. Taxpayers can deduct certain unreimbursed medical expenses that exceed 7.5% of 2018 AGI. State and local taxes are now capped at $10,000; this includes income taxes paid to the state government, state and local real property taxes, and state and local personal property taxes (such as driver’s license fees). Taxes paid for property held for investment is still deductible in full and does not fall within the $10,000 overall limitation. Same as in prior years, you take the higher of standard deduction or itemized deductions. Therefore, itemized deductions won’t have an impact on your tax return if they don’t cumulatively exceed the new, higher standard deduction. The phaseout of itemized deductions has been temporarily repealed which means taxpayer’s itemized deductions are no longer limited if their adjusted gross income reaches over a certain amount. The “199A Deduction” has to be the most talked about deduction in 2018. For tax years beginning in 2018 through 2025, the TCJA establishes this new deduction based on a noncorporate owner’s qualified business income (QBI). This break is available to individuals, estates and trusts that own interests in pass-through business entities. The deduction generally equals 20% of QBI, subject to restrictions that can apply at higher income levels. Refer to our business letter for further details. The PATH Act made permanent the ability of individuals of 70-1/2 years or older to exclude from gross income qualified charitable distribution from IRAs of up to $100,000 per year. On the other hand, no donation deduction is allowed. This is an extremely useful tool under the TCJA as lesser taxpayers will be itemizing due to increase of standard deductions and various limitation put on itemized deductions. Taxpayers can no longer recharacterize a conversion from a traditional IRA, SEP, or SIMPLE to a Roth IRA. The new law also prohibits recharacterizing amounts rolled over to a Roth IRA from other retirement plans, such as 401(k) or 403(b) plans. You can still treat a regular contribution made to a Roth IRA or to a traditional IRA as having been made to the other type of IRA. The personal exemption of $4,050 has been repealed for tax years 2018 to 2025. Under the old law, this would have been taken as an additional deduction for yourself, your spouse, and your eligible dependents. Like the NII tax, the alternative minimum tax (AMT) also requires personalized attention. For 2018, the exemption amounts are $70,300 for single individuals and heads of household; $109,400 for married couples filing a joint return and surviving spouses; and $54,700 for married couples filing separate returns. The AMT phaseout thresholds are also increased in 2018 to $500,000 for single individuals, heads of household, and married couples filing separate returns; and $1 million for married couples filing a joint return and surviving spouses. There are steps that taxpayers subject to AMT can take to reduce its effect on their tax liability. For instance, taxpayers can undertake to eliminate certain tax preferences. Certain deductions, including the accelerated depreciation deduction on real property, as well expensed research and development costs and expensed mining exploration and development costs, are tax preference items only to the extent that they exceed an otherwise allowable deduction. However, with State and Local Tax Deductions being cap at $10,000, we are expecting much less taxpayers being subject to AMT. A 3.8% surtax applies to the lesser of (1) net investment income or (2) the excess of modified adjusted gross income (MAGI) over the threshold amount ($250,000 for joint filers or surviving spouses, $125,000 for a married individual filing a separate return, and $200,000 for other taxpayers). MAGI is adjusted gross income (AGI) increased by the amount excluded from income as foreign earned income (net of the deductions and exclusions disallowed with respect to the foreign earned income). The 3.8% surtax applies to gross income from interest, dividends, annuities, royalties, and rents, unless those items are derived in the ordinary course of a trade or business to which the tax doesn’t apply. The tax also applies to income generated from a trade or business if it is a passive activity of the taxpayer. Hence, the tax doesn’t apply to active businesses conducted by a sole proprietor, partnership, or S corporation. Investment income does not include any amount subject to the self-employment tax, and doesn’t include amounts distributed from retirement plans. As year-end nears, a taxpayer’s approach to minimizing or eliminating the 3.8% surtax will depend on his or her estimated MAGI and net investment income (NII) for the year. Some taxpayers should consider ways to minimize (e.g., through deferral) additional NII for the balance of the year, others should try to see if they can reduce MAGI other than unearned income, and others will need to consider ways to minimize both NII and other types of MAGI. One way to reduce NII is to recognize losses on stocks and use them to offset other gains taken earlier this year. In addition, taxpayers that own interests in a number of passive activities also should reexamine the way they group their activities. Taxpayers expecting significant gains on sale of property may want to consider using the installment method to spread out the taxable gain on sale if applicable. The 0.9% additional Medicare tax also may require higher-income earners to take year-end actions. It applies to individuals for whom the sum of their employment wages and their self-employment income is in excess of an unindexed threshold amount. The threshold amounts are $200,000 for single individuals and heads of household; $250,000 for married couples filing a joint return; and $125,000 for married individuals filing separate returns. There could be situations where an employee may need to have more taxes withheld toward the end of the year to cover the tax. For example, if an individual earns $200,000 from one employer during the first half of the year and a like amount from another employer during the balance of the year, he or she would owe the additional Medicare tax, but there would be no withholding be either employer for the additional Medicare tax since wages from each employer don’t exceed $200,000. If you feel you do not have enough income tax withholding to cover this tax, you may request that your employer process additional withholding from your income. For tax year 2018 participants who have self-only coverage in a Medical Savings Account, the plan must have an annual deductible that is not less than $2,300; but not more than $3,450. For self-only coverage, the maximum out-of-pocket, expense amount is $4,550. For tax year 2018 participants with family coverage, the floor for the annual deductible increases by $50 to $4,550, however the deductible cannot be more than $6,850. For family coverage, the out-of-pocket expense limit increases to $8,400 for tax year 2018. Net capital gains and qualified dividends are taxed at zero percent for joint filers or surviving spouses with taxable income below $77,200, heads of households with taxable income below $51,700, and unmarried taxpayers and married filing separately with taxable income below $38,600. The rate is 15% for joint filers or surviving spouses with taxable income below $479,000, heads of households with taxable income below $452,400, and unmarried taxpayers and married filing separately with taxable income below $239,500. Taxpayers with taxable income equal to or exceeding these amounts are subject to a 20% tax on net capital gains and qualified dividend income. The annual exclusion for gifts went up from $14,000 to $15,000 in 2018. Make gifts sheltered by the annual gift tax exclusion before the end of the year and thereby save gift taxes. The exclusion applies to gifts of up to $15,000 made in 2018 to each of an unlimited number of individuals. You can’t carry over unused exclusions from one year to the next. The transfers also may save family income taxes where income-earning property is gifted to family members in lower income tax brackets who are not subject to the kiddie tax. There is a special election available for estates and complex trusts for distributions made to a beneficiary within 65 days following the end of a tax year. The fiduciary can elect to treat any such distribution or part of a distribution as having been made in the prior year. The effect of this election is that the deduction for the distribution can be taken by the estate or trust in the year before the distribution was actually made. However, the beneficiary receiving the distribution must also be taxed on the distribution in the year before the distribution was actually received. •	the estate’s or trust’s DNI, reduced by amounts paid or required to be distributed during the tax year, other than amounts subject to the 65-day election. This election is made on Form 1041. Once made, the election is irrevocable, but is binding only for that year. The 65-day election is not available for accumulation distributions. Under the Tax Cuts and Jobs Act, you must continue to report coverage, qualify for an exemption, or report an individual shared responsibility payment for tax year 2018. You may have heard that tax reform eliminated the Affordable Care Act (ACA) individual penalty, but it’s important to note that the removal of the healthcare tax penalty for those who do not have minimum essential health coverage starts with tax year 2019. A nonrefundable tax credit is available to an individual for residential energy efficient property placed in service before January 1, 2022, and installed on, or in connection with, a dwelling unit located in the United States and used as a residence by the taxpayer. The credit is available for qualified solar electric property, qualified solar water heating property, qualified fuel cell property, qualified small wind energy property, and geothermal heat pump property. Cooperative and condominium dwellers can claim the credit by splitting the cost of installing equipment with other unit owners. The credit is 30 percent of the cost of eligible property placed in service in 2017, 2018, or 2019; 26 percent of the cost of eligible property placed in service in 2020; and 22 percent of the cost of eligible property placed in service in 2021. There is also a $500 credit limit with respect to each 0.5 kilowatt of capacity of qualified fuel cell property expenditures for each tax year. •	The Mental Health Services Tax Rate is 1% for taxable income in excess of $1,000,000. •	You can view complete details on the California tax brackets using the website below. These are just some of the year-end steps that can be taken to save taxes. Again, by contacting us, we can tailor a plan that will work best for you.